Confluence vs MindTouch. What is the best Wiki software? MindTouch makes the world's most respected social knowledge base. It powers purpose-built help 2.0 communities that connect companies with their customers. 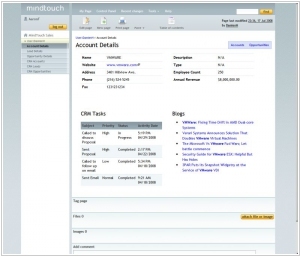 MindTouch - it an enterprise open source Wiki-platform, that grew out of the MediaWiki CMS. MindTouch is deployed by many large companies, including Microsoft, Fujitsu, Siemens, Intel, The Washington Post, and others. And Forrester recently called MindTouch the best alternative to Sharepoint and Lotus. But the most interesting is that MindTouch founder and CEO, Aaron Fulkerson - is an outspoken opponent of Social software, that most people now perceive as the main trend of Enterprise 2.0. He is confident that the main MindTouch competitors - SocialText and PBWiki - are going the wrong direction, adding more and more social tools to their wiki-systems. In contrast to enterprise Social Networks, Fulkerson invented a new concept - Collaborative Networks, and in accordance with this concept the MindTouch is developed. Fulkerson sais that social software vendors - blindly copy tools from consumer social networks (forums, microblogs, friending, ratings, tags, chats ...) and create the numerous enterprise facebooks and twitters. But these networks, as well as their instruments - are not designed for business and collaboration. They were created for self-realization, talks with friends and time spending. But conversations can not replace the work. Compare Wikipedia to Facebook. In Wikipedia, the work is being done - documents are created. However, we do not see the bright profiles of those who make this work, we do not know who are their friends (like in Facebook). We see the measurable result, not the meaningless discussions. In order to solve practical business tasks (such as a project plan development or finding the cause of falling profits) you need to set a workspace, display there the specific data from the multiplicity of data and application silos (ERP, CRM) and other information sources (including social networks ), and give employees the opportunity to form a structured document, which has a real value now and can be reused later. And this is the very functionality that MindTouch provides.